Dubai, UAE, May 10, 2018: Back to basics and looking ahead to futuristic favorites, Swatch introduces its latest Spring-Summer 2018 collection, which dives into the Swiss watchmaker’s DNA. Spring and summer are all about the great outdoors, and Swatch takes the party from the garden to the street before heading to the beach. Created with a glance at the past, the brand’s newest hits reinterpret its design icons with inspiration from the latest trends. The energetic and eclectic latest Spring-Summer 2018 collection is a call to live in the moment, to be authentic and to embrace things that shatter monotony. The collection proves that every cool lifestyle can be Swatch-y. 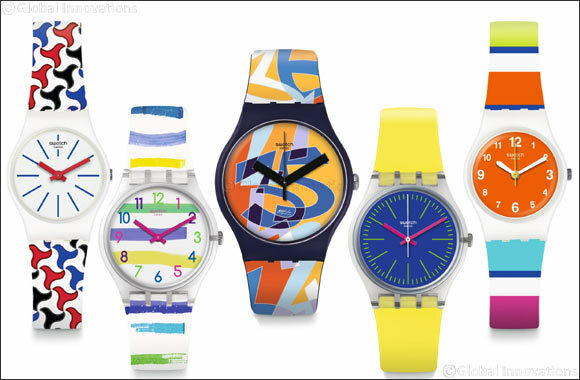 This swatch collection ranges from AED 225 - AED 300 and is available across Swatch stores.